318 pages | 8 B/W Illus. Other topics include the police/protestor relationship and low-profile versus high-profile policing strategies in crowd control, the growing strategy of private security in working with public police forces, and enhancing public safety in post-conflict regions. 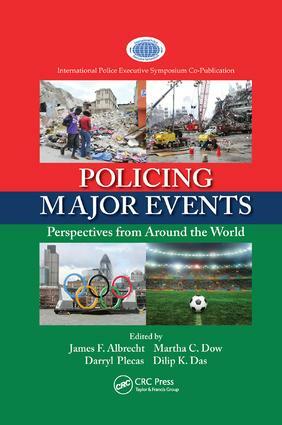 The concepts presented in Policing Major Events: Perspectives from Around the World will enable police departments to improve their readiness for policing major events across a diverse set of events and socio-political contexts. James "Jimmy" F. Albrecht is a professor of criminal justice and homeland security at Pace University in New York City. Professor Albrecht has 25 years of front-line law enforcement experience, and had previously held a number of executive positions including police chief of criminal investigations in the joint European Union/U.S. (EULEX) Police in Kosovo (former Yugoslavia). He retired as NYPD captain and regional commander after serving 22 years, which included direct response to the tragic September 11, 2001 attacks on the World Trade Center. He is completing his Ph.D. in criminal justice at the University of New Haven (Connecticut). Martha C. Dow, Ph.D.,is an associate professor in sociology at the University of the Fraser Valley in British Columbia, Canada. Dr. Dow has extensive experience working with policing, correctional, and fire service agencies exploring issues related to organizational change and leadership models, recruitment, retention and succession of officers, diversity, and community relations. Many of her research projects explore how public safety agencies, community organizations, schools, and universities might support more progressive professional practices. In addition, Dr. Dow has presented at numerous international conferences and has served on a variety of governmental and community-based committees. Darryl Plecas, Ed.D.,is an elected member of the Legislative Assembly of British Columbia in Canada and is serving the Abbotsford South community. He was appointed parliamentary secretary to the Minister of Justice and Attorney General for Crime Reduction shortly after his election to the Legislative Assembly in May 2013. He is professor emeritus at the University of the Fraser Valley in British Columbia, Canada. Most recently, he served as the RCMP University Research Chair and director of the Centre for Public Safety and Criminal Justice Research in the university’s School of Criminology and Criminal Justice. Dilip K. Das, Ph.D.,has extensive experience in police practice, research, writing, and education. A professor of criminal justice, former police chief, founding editor-in-chief of Police Practice and Research: An International Journal, Dr. Das is a human rights consultant to the United Nations. Founding president of the International Police Executive Symposium, Dr. Das has authored, edited, and coedited more than 30 books and numerous articles. He has traveled extensively throughout the world in comparative police research, as a visiting professor in various universities, and for organizing annual conferences of the IPES. Dr. Das has received several faculty excellence awards and has been recognized as a Distinguished Faculty Lecturer.